Home » News » What are the Most Common Construction Accidents? 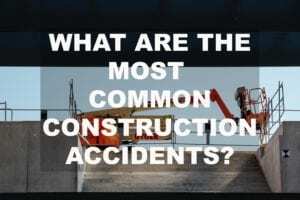 What are the Most Common Construction Accidents? No one wants to see employees, workers, visitors or colleagues injured on a construction site, but accidents do occur and sometimes they are very serious. When construction site accidents do happen, contact a construction accident attorney to help determine whether you have the basis for a personal injury claim. Despite best efforts to keep construction sites reasonably safe, most construction work is inherently dangerous and workers do get injured. When injured, workers’ compensation benefits are only one option available for injured parties. Workers in Maine who are injured as a result of construction site negligence should consult with a skilled construction accident attorney to determine whether lawful claims exist in addition to workers’ compensation. Construction injuries are unfortunately numerous and varied. Though some are easy to define, others are less obvious. Familiarizing yourself with common injury types will help you avoid injury and identify any injuries you may have already suffered. The following types of injuries and explanations are some of the most common construction injuries suffered by workers. What is the Most Common Injury in Construction? One of the most common types of construction site injuries is a slip and fall. Construction sites can be full of demanding activities at an exceptionally busy pace. Work areas are congested with building materials, scattered debris, equipment, tools, incidental spillage from oil or grease, and loud, distracting noises. On any given day, workers negotiate a virtual obstacle course to perform their job. In an environment of congestion, obstructions, and distractions, it’s no wonder that thousands of workers trip over materials and obstacles annually, resulting in serious falls. Fractures, back injuries, and head injuries, and more can happen in a slip and fall accident. Maine construction workers also are subject to harsh seasonal conditions; snow and ice on job sites increase risks and hazards significantly. As with slip and fall accidents, construction workers are also at risk of falling from scaffolding, cranes, ladders, and roofs. Hazards on the construction site become so common that workers preoccupied with completing their tasks can easily overlook the risks all around them. The most common cause of falling from a height is the lack of a guardrail or some type of safety netting in place. The force of gravity contributes to one of the more common injuries that happen at construction sites. Hammers, buckets, various tools, materials and debris falling from scaffolding and rooftops pose a threat to serious injury daily; and sadly, with a potentially fatal outcome. Since OHSA began recording such injuries, the Bureau of Labor Statistics has reported more than 50,000 people annually are struck by a falling object on a job site. That is, statistically, one person is injured every ten minutes by a dropped object. Heavy machine equipment and vehicles on worksites are another cause of construction site accidents. Forklift failing, dumpsters being dropped or falling over unexpectedly, or a nail gun malfunction, are some examples of causes of injuries. Equipment could be dated, unsafe and dangerous, or the product may be defective. A common cause of these types of accidents is carelessness or lack of training when workers are struck by reversing cars or clipped by forklift trucks. Common medical conditions resulting from injuries at construction sites are extensive. Beyond such medical conditions is the very real threat of being killed on the job because of negligence, or the Post-Traumatic Stress Disorder (PTSD) from witnessing the traumatic death of a fellow worker. Who to Call When You Need a Construction Accident Attorney? Construction site workers face potential hazards every day on the job. From building bridges to large-scale commercial projects to remodeling an office or apartment, accidents can and do happen. If you or a family member has been hurt on a construction job, consult a construction accident attorney to know if you have a personal injury case.